CM Super Strong Shackles are carbon-type shackles with strength ratings that are 17 to 50% stronger than comparable sized carbon shackles, and they boast a strong 6:1 safety factor. Manufactured from technically advanced micro alloy steel with optimal hardness for strength and ductility, these shackles will show major deformation prior to failure. The Working Load Limit (WLL) and product traceability codes are permanently marked on each shackle body. All sizes feature quenched and tempered bolts. 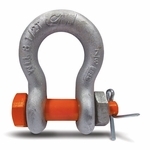 Bolt type anchor shackles--also know as "safety shackles"--provide the most secure pin arrangement and will resist axial loading and torsional loading, but should only be used in applications where shackle is infrequently or never removed.